Crafting handmade bags are all the rage these days. Making handmade handbags are fun, economical and a perfect way to jazz up your wardrobe. Making handmade bags are the perfect way to show your creative side without burning a hole in your pocket. 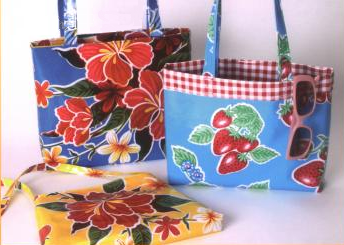 If you plan to make a business selling handmade bags later on, you will need to start creating bags for yourself first. • Before you head out to the crafts store to purchase your supplies, look around your house first. Do you have fabrics in your cabinets that have not been used for years? Do you have old fabrics that are still in good condition that can be used as lining? While you are at it, also look for different supplies as well. • Check if the fabric is strong enough to handle when things are placed inside. Once you found your fabric, it is time to come up with a good design. There are a lot of ideas that can be found online and from magazines. Just take note not to copy the whole design. Use them as inspiration in making your bags. You can use a pattern paper to put your designs. Work by area so it is more organized and easier. • Get lining and cut it the same size of your fabric. It is optional for you if you want to sew the each side with the lining first. But you can also sew the both sides of the fabric together with the lining. • Now that you have your fabric and your idea, you need to do in making your handmade bag is to fold the rectangles in thirds, lengthwise. Then make two creases on the wrong side of the fabric. Ready your sewing machine and fix the settings. • Once the sewing machine is ready, it is time to assemble the parts. Sew the wrong sides together. When you sew them, this would create the seams. Sew the corners as well, make sure that the fabrics are even when you sew them. Once you are done, if you want to make a handmade handbag, a good idea is to create a handle holder to so can easily change your handles. But, if you want the handle made from the same fabric, simply use a portion of the fabric; cut it to 4 equal strips and sew together the same way you did with the body. • If you want to incorporate designs, you will have to do that before you sew the parts together. Use textile paint to create patterns or you can do silkscreen printing as well. You can use beads and other fabrics to create texture and highlights onto the main fabric. Mary is a registered nurse who decided to stay at home and take care of her kids. She was introduced to writing by a friend and not it has become her passion. 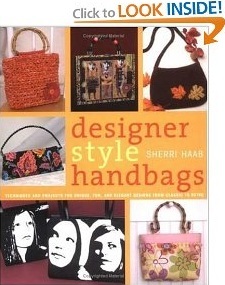 This book makes it a cinch to create fashionable, one-of-a-kind purses and totes. Start with one of ten easy-to-sew bags, from a classic rectangular purse wit two chic variations to a glamorous evening clutch that sparkles with squins and beads. Don't sew (or don't want to)? Make a plain bag with one of ten popular crafting techniques, including collage, polymer clay, phot transfer, and stenciling. Fully illustrated with clear, step-by-step directions, this book has projects and techniques to satisfy every style and skill level, from beginning crafter to accomplished stitcher.